Ingredients: glycerin, cannabis sativa seed oil, vitis vinifera (grape) seed oil, camelina sativa seed oil, crambe abyssinica seed oil, sucrose palmitate, glycolic acid, aqua (water), hydrogenated vegetable oil, polyglyceryl-2 dipolyhydroxystearate, dipalmitoyl hydroxyproline, rosa canina fruit oil, maris aqua (sea water), phenoxyethanol, ectoin, helianthus annuus (sunflower) seed oil, hydrolyzed jojoba esters, tocopherol, rosa damascena flower oil, jojoba esters, magnesium aspartate, zinc gluconate, rosmarinus officinalis (rosemary) leaf extract, bioflavonoids, chlorogenic acids, citric acid, glucose, copper gluconate, hydrolyzed rhodophyceae extract, ethylhexylglycerin. 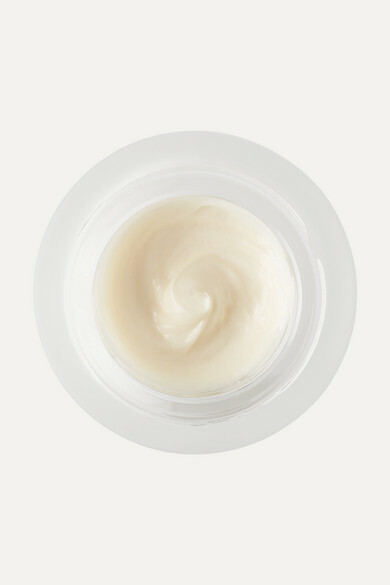 Eve Lom's 'Radiance Antioxidant Eye Cream' is infused with a powerful multi-peptide complex that helps to reduce the look of dark circles and restore firmness to the delicate under eye area. It bolsters the skin's natural moisture barrier and protects against external stressors that can cause damage. Apply it both morning and evening as part of your daily skincare regimen.